Vaiga 2018 and Krishi Unnathi Mela starts from 27th December 2018. 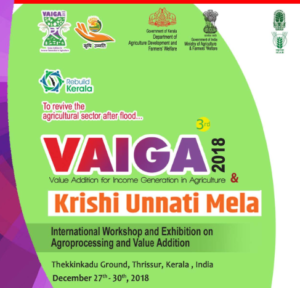 Third edition of Vaiga 2018 and Krishi Unnathi Mela, an international exhibition in the field of agriculture will be held from 27th to 30th December 2018, at Thekkinkadu Ground, Thrissur, Kerala, South India. This year the aim is for the revival of agriculture sector after flood in Kerala. Eminent personalities and scientists from the agriculture and related fields will participate in the mela. There will be exhibitions, seminars, workshops and other activities held during these days. Farmers in the various fields will share their experiences.